Experience an enchanting evening of romance at Alma by Juan Amador! The elegant restaurant nestled in the historic Goodwood Park Hotel has been awarded the 1-Michelin star for three years in a row for its excellent European-Asian fusion cuisine. Bring your dream wedding to life with our team of dedicated professionals, and create a cosy and intimate night to remember! Couples can get a sampling of the exquisite menu items here at the restaurant. Alma is also one of the biggest importers of American wine in Singapore, so wine-lovers will definitely be spoilt for choice. Sign up for the wedding showcase now and stand to win a complimentary Michelin-worthy meal for 2! Alma by Juan Amador can host a wedding of up to 100pax only. Open for bookings for weddings held on or before 31 December 2019. 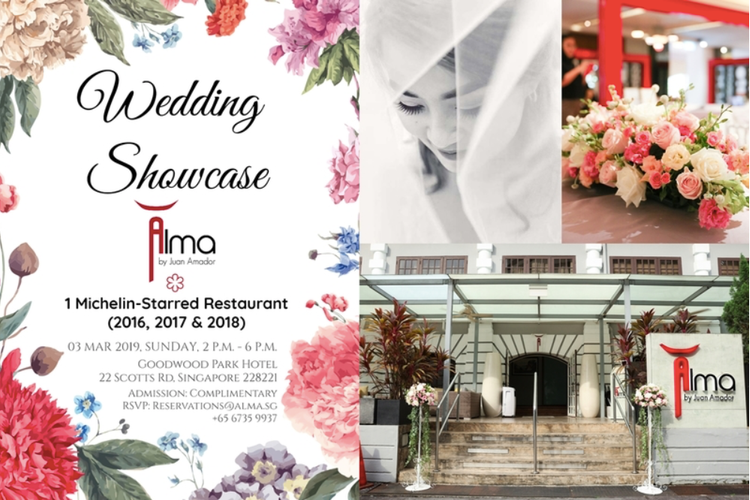 For more information, contact us at reservations@alma.sg or call +65 6735 9937.